Founded in 2006 by Juan Reyero, GreaterSkies is a small, international company that produces personalized star maps. Juan says that he has always had an interest in astronomy, and that he started making star maps as a hobby, simply because it was fun and he liked it. Formerly an R&D engineer for Hewlett-Packard, Juan specialized in developing image processing algorithms for printers. Using sources also employed by NASA, such as the Hipparcos Catalog, the Yale Bright Star Catalog, and the Gliese Catalog of Nearby Stars, Juan developed a computer program to create star maps as gifts for friends. As more friends saw the maps and wanted their own, the business began to grow organically. 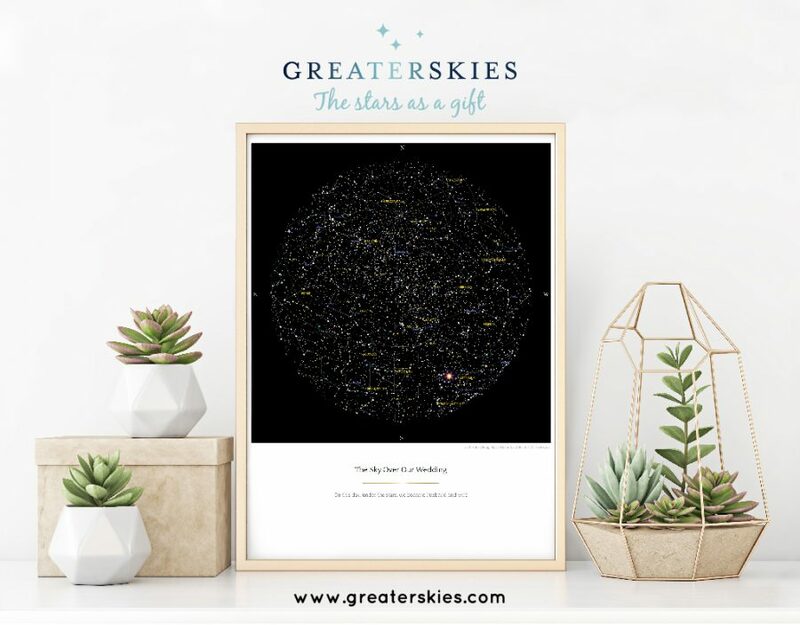 GreaterSkies has continued to grow primarily by word of mouth, selling over 20,000 star maps all over the world to date. Customers often add a personalized message to their high-definition stars maps, commemorating special events like birthdays, weddings, or anniversaries. Juan says that it is very important to him to make the maps as accurate as possible. He continues to improve his computer programming, and although he knows that it isn’t as important to most customers as it is to him, he is “kind of obsessive about doing it right and that is part of it.” To him, the accuracy and attention to detail is essential to producing a quality product. His maps show 7,000 to 8,000 stars, and the colors of the stars are as faithful as possible. The maps also include the sun, moon, and all the planets that would be visible from a precise location at an exact time — down to the minute, for past or future dates — anywhere on the planet. When GreaterSkies decided to partner with a non-profit organization, Juan thought a lot about what cause to support. Because the International Dark-Sky Association’s work is so linked to GreaterSkies’ core business, working together seemed like a natural fit. As a Brand Partner, GreaterSkies will be attending the IDA Annual General Meeting this November, and will be honoring IDA’s 30th anniversary with a star map of the organization’s foundation. As Juan says, the mission of both organizations is essentially the same: to get people in touch with the night sky. Juan’s ideas for his company are as limitless as the night sky. Currently, he is working on several new designs for star maps and growing his business. Although the founder of GreaterSkies says that his business is “very improbable and unlikely,” it seems he’s found a very probable and likely formula for success. IDA looks forward to working together with GreaterSkies to highlight the importance of preserving the world’s dark skies.